The Riversdale Avenue of Honour Memorial Oak avenue was planted 8 August 2007 and unveiled on Passchendaele Day 12 October 2007. The date was chosen to commemorate the 90th Anniversary of the fateful attack towards Bellevue Spur at The First Battle of Passchendaele in 1917 by both battalions of The Otago Regiment, and where five men from the district lost their lives and whose bodies were never found. In lives lost (2,735), this is considered New Zealand's 'blackest day' (Cadwallader, 2013). The following article describing the commemorative planting was published in the Gore Ensign, October 2017. AT 5.25am on October 12, 1917, the two battalions of the Otago Regiment ‘‘went over the top’’ at Passchendaele, Belgium, in an action that is still New Zealand’s most costly action in war. Ninety years later, a world away in Riversdale, New Zealand, at 5.25pm on October 12, about 200 people took part in unveiling Riversdale’s Avenue of Honour. Riversdale-Waikaka RSA treasurer Don Mackay said the avenue of honour was a row of 25 oak trees planted along the edge of the Gore-Lumsden highway — on the left leading out of Riversdale towards Balfour, to honour the fallen from the area in war. ‘‘The first plaque and tree commemorates a soldier who fell in the Boer War, with the next 23 trees and plaques commemorating specific soldiers who fell in the First World War. ‘‘The final plaque and tree, where the ceremony was carried out on Friday, is allencompassing to recognise all soldiers from the district who have fallen in wars,’’ Mr Mackay said. Following blessings and prayers, a New Zealand flag resting on the final plaque was unfurled by MP for Clutha-Southland, the Hon Bill English, and a veteran of the Pacific war, Ian Kinley. An opportunity was given to those present to place a sprig of rosemary on a plaque of their choosing. Mr Mackay said rosemary was an ancient way to commemorate the dead and was a fitting tribute. Gore man Fred Sutherland stopped to place rosemary sprigs on two of the plaques in the avenue of honour. 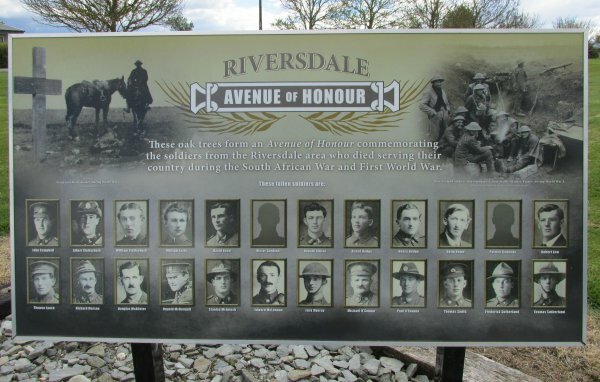 ‘‘Two of my uncles came from Riversdale and have plaques in this avenue of honour. ‘‘What this community is doing to honour its war dead is just fantastic. ‘‘I think every region should be looking at something similar,’’ Mr Sutherland said. Mr Mackay said a commemorative dinner, after the official unveiling of the memorial, was attended by more than 190 people, to ‘‘remember the 80 men from the wider district, and especially the 24 men to whom we dedicated trees’’. The dinner was also a special treat for the veterans’ widows, he said. ‘‘Bill [English] spoke at the dinner and the Director of Veterans’ Affairs, Jessie Gunn, who had flown from Passchendaele to attend, gave a speech. ‘‘She was literally just off the plane and said it was her first meal since leaving Belgium,’’ Mr Mackay said. One of the highlights of the evening was a poem, Safe and Well, read by 74-year-old Alice McAlister, nee Stevenson. As a 12-year-old schoolgirl, Alice was to have read the poem in January 1945 as an early welcome home for some local soldiers. Unfortunately, there was a poliomyelitis outbreak at the time, and Alice — along with children from throughout New Zealand — was confined to her house and missed the opportunity. Sixty-two years later, she got her chance. In keeping with the traditions that marked the commemoration, Friday evening concluded with a rousing version of We’ll Meet Again, a 1939 song made famous by vera Lynn. The avenue of honour was almost fully funded by the Department of Veterans’ Affairs, as was a book, The Fallen, written by Don Mackay about the soldiers of the district who had fallen in war. It is a commemoration of the men from Riversdale, Wendon, Wendonside and Waikaia who lost their lives during the wars of the 20th century. - Copies of the book are available from Gore RSA, Gore Historical Museum, Paper Plus, Riversdale Supermarket and the Waikaia Commercial Hotel for $30, with all proceeds from the sales going to RSA welfare. Unveiling: Ian Kinley (left) and MP for Clutha-Southland Bill English with the New Zealand flag that was folded on top of the final plaque in the Riversdale Avenue of Honour, to remember the soldiers from the district who fell in war.